Was Franklin Roosevelt planning to intervene on Great Britain’s behalf before Pearl Harbor? Winston Churchill, for one, thought so. This is a story of what might have been. If Japan had chosen to attack far-off British Malaya on December 7, 1941, instead of Pearl Harbor, Hawaii, President Franklin Roosevelt was prepared to go before Congress and ask—for the first time in American history—for a declaration of war against a nation that had not fired the first shot against us. With the country solidly divided on the issue of getting involved in the war that was already raging in Europe, and with the president’s repeated promises not to send American boys to fight in a foreign war still ringing in congressional ears, the outcome of Roosevelt’s appeal was not preordained. Indeed, there is some reason to think that his appeal would have been rejected by an isolationist Congress, in which case the history of World War II would have been very different. The circumstances surrounding FDR’s undelivered declaration began in August 1941, in obscure Argentia Harbor inside Placentia Bay, Newfoundland. There, four months before Pearl Harbor, Roosevelt and British Prime Minister Winston Churchill met secretly to thrash out the terms of what came to be called the Atlantic Charter. One of the primary objectives of the English-speaking leaders’ first summit was to come to some agreement regarding the increasingly aggressive and threatening moves the Japanese were making in the Far East. Churchill stressed the urgent need to make a joint declaration to the Japanese to either back off or face the consequences. Having barely escaped invasion by the Nazis a year earlier, the British had been forced out of Greece by the Germans in April, and now found themselves locked in a bitter struggle with General Erwin Rommel’s much-vaunted Afrika Korps in northern Africa. Spread desperately thin, the British were seeking a way to force the Japanese to reconsider attacking Malaya or the Dutch East Indies. That way, as Churchill understood, it was to have the United States agree to declare war on Japan if Malaya was attacked. Following the fall of France in July 1940, a pro-Nazi government had been installed in Vichy in the southern part of the country. the Vichy government asserted control of all French colonies, including those in Indochina. As a signatory to the Tripartite Pact with Germany and Italy in September 1940, the Japanese immediately occupied eight strategically located air bases and the two major seaports in the region. In somewhat dilatory response, the United States, Great Britain, and the Netherlands notified Japan in July 1941 that unless it immediately withdrew its forces from Indochina, all trade would stop and an embargo on desperately needed oil would go into effect. In a meeting with Japanese Ambassador Kichisaburo Nomura in Washington, Roosevelt warned that if the Japanese attempted to seize oil-rich Borneo in the Netherlands East Indies, the Dutch and the British, who had committed to giving their Far East neighbors “all possible assistance,” would jointly declare war on Japan. 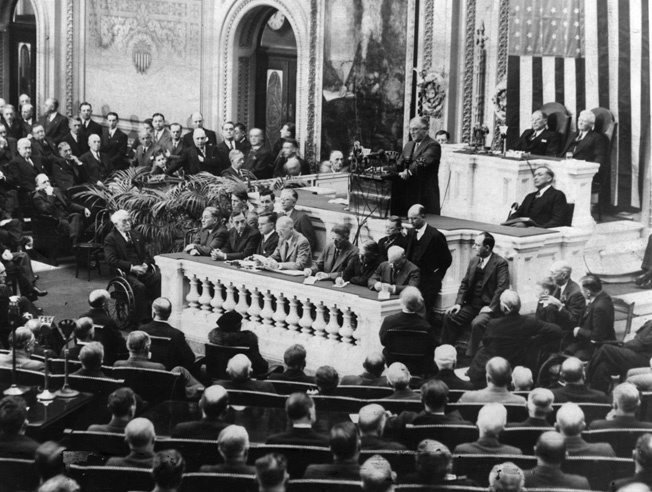 President Roosevelt addresses Congress during a 1939 State of the Union address. He would appear again, most memorably in December 1941. 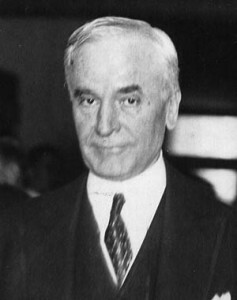 Secretary of State Cordell Hull. In the final draft, which Roosevelt delivered to Ambassador Nomura on August 12, the document said only that “the government of the United States will take all steps toward safeguarding the legitimate rights and interest of the United States and American nationals and toward insuring the safety and security of the United States.” The next day, Roosevelt sent another Hull-drafted message to Churchill that cleverly avoided the contents of the toothless statement the president had just delivered to Nomura. Roosevelt’s message said, in part, “I made to him a statement along the lines of the proposed statement such as you and I had discussed. The statement I made to him was no less vigorous than and substantially similar to the statement we had discussed.” Although alarmed by the president’s watered-down statement, Churchill continued to hang on to the assurance Roosevelt had given him at the Atlantic conference that an aggressive Japanese move against the British or Dutch would bring America into the fight. On November 7, Roosevelt cabled back that he doubted such a Japanese land campaign was imminent. “We feel that continuing efforts to strengthen our defenses in the Philippines, paralleled by similar efforts by you in the Singapore area, will tend to increase Japan’s hesitation,” Roosevelt wrote. The president was still unsure what to do if Japan attacked the British and Dutch, but not the United States. Regarding that question, on the afternoon of November 17, he polled his Cabinet on whether they thought the American people “would back us up if we responded to such an attack with military action.” Responding with an overwhelming yes, the Cabinet agreed that Roosevelt should emphasize the increasingly critical situation in the press and in his speeches. At that point, U.S. intelligence intercepted a Japanese diplomatic message relating to Roosevelt’s attempt to reach a temporary agreement pending a final settlement of the Malaysian situation. The coded message revealed that the Japanese embassy in Washington was preparing to repatriate its nonessential personnel, indicating that it would reject any negotiated settlement with the Allies that would require Japan to formally withdraw from the Tripartite Pact with Germany and Italy. Meanwhile, the two Japanese ambassadors (Nomura had been joined by Saburo Kurusu) were told to agree to refrain from further “armed advancement” for three months while negotiations continued over the major points of disagreement. Satisfied that both sides had accepted each other’s preliminary terms, the two ambassadors met with Secretary of State Hull on November 26. They were dumbfounded when Hull presented them with a 10-point attachment to the U.S. proposal. The document so stunned the unsuspecting Japanese that Nomura, in his report to Tokyo that afternoon, said that it could only be interpreted as an “ultimatum.” In the addendum, Japan was enjoined to withdraw all military, naval, air, and police forces from China and Indochina and to recognize the sovereignty of the National Government of the Republic of China. The attachment was strongly influenced by a report to Roosevelt from British Ambassador Lord Halifax in which the president had been informed that 30 Japanese troop transports carrying 30,000 to 40,000 men had just left the Shantung peninsula for the south of China. If the report was correct, it meant that the Japanese were already breaking faith with the Allies while negotiations were still under way—war might break out at any time. The Japanese moves put renewed pressure on Roosevelt to live up to his commitment to Churchill at the Atlantic Conference. Anticipating that the presence of the Japanese expedition indicated a move against either Thailand or Malaya, Churchill sent a desperate plea to Roosevelt on November 30. “I beg you to consider whether, at the moment which may be very near, you should not say that ‘any further Japanese aggression would compel you to place the gravest issues before Congress,’” the British prime minister implored. Stimson’s stated conclusion that Roosevelt was “undoubtedly considering an attack on Jap forces threatening Southeast Asia” was incorrect. Instead, Roosevelt was scrambling to avoid having to make an after-the-fact appeal to Congress, in light of additional intelligence reports on December 1 that the Japanese expedition had rounded the southern tip of Indochina and was heading into the Gulf of Siam. 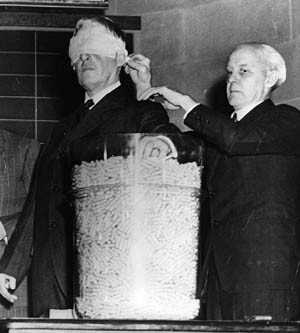 With blindfold in place, Secretary of War Henry Stimson draws numbers for the first peacetime draft in the fall of 1940. In response to that decision, Roosevelt instructed his chief of naval operations to order the Asiatic Fleet to send a line of ships directly into harm’s way in the Gulf of Siam, hoping to entice the Japanese to fire the first shot. Admiral Harold Stark immediately sent a telegram to Asiatic Fleet commander Admiral Thomas Hart in Manila, directing him to send three small vessels to form a “defensive information patrol” and to report any Japanese movements in the West China Sea and the Gulf of Siam. The Army Air Force was already shadowing the Japanese moves. Roosevelt was pulling out all stops to avoid having to go before Congress and ask for a declaration of war based solely on his agreement with Churchill. He asked Hull to send the completed draft of the speech he would deliver to Congress as a last-minute warning if the Japanese continued their intrusion into the Gulf of Siam. Completed on the 29th, the draft was forwarded to the president that afternoon. In a memorandum to the speech, Hull concluded with the rather curious statement, “I think we agree that you will not send a message to Congress until the last stage of our relations, relating to actual hostility, has been reached.” Meanwhile, on the morning of Saturday, December 6, Roosevelt decided to send a last-ditch appeal to the Japanese emperor. It was precipitated by a message from the United States ambassador to Britain, John Winant, marked “triple priority and most urgent,” advising that the British Admiralty had reported seeing two large Japanese invasion forces off the coast of Cambodia, sailing slowly westward. The next morning, the Japanese attacked Pearl Harbor, rendering moot Roosevelt’s planned address. There would be no need to intervene in Great Britain’s behalf—it was now America’s war, as well. The entry in Henry Stimson’s diary that night summed up what leaders were thinking on both sides of the Atlantic. “When the news first came that Japan had attacked us,” Stimson wrote, “my first feeling was of relief —that indecision was over and that a crisis had come in a way which would unite all our people.” Pearl Harbor, not Malaya, had been the flashpoint. Tags Admiral Harold Stark, admiral thomas hart, Africa, Afrika Korps, Allies, American, Anthony Eden, Asia, Asiatic Fleet, Atlantic Charter, Axis, Borneo, Britain, British, British Admiralty, Burma, Burma Road, Chiang Kai-shek, China, CIA, cod, Cordell Hull, Dutch, Dutch East Indies, Erwin Rommel, Europe, FDR, France, Franklin Roosevelt, French, general, general erwin rommel, German, Germany, Great Britain, Greece, Hawaii, HBO, Henry L. Stimson, Indochina, Isolationists, Italy, Japan, Japanese, japanese attacked pearl harbor, Kichisaburo Nomura, Lord Halifax, Malaya, Manila, Mary, military, NATO, navy, Nazi, Netherlands, Newfoundland, OSS, Pacific, Pearl Harbor, Philippines, POW, Selective Service Act, siam, singapore, telegraph, Tern, thailand, the history of world war ii, Tokyo, Tory, Tripartite Pact, Troy, Union, United States, us military, WIN, Winston Churchill, World War I.